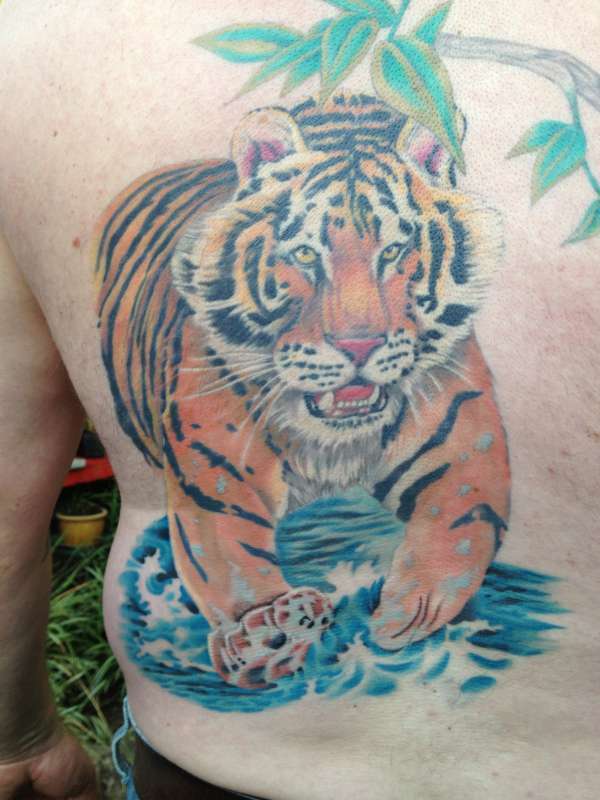 This was done at the same time as my owl,it is "The Running Tiger" it's on the middle to left hand side of my back. Tattoo by Greg Hoskins at Ink Up studio Thomastown. This is actually a new peice but done in an old school style, to suit the rest of my old style Tattoo's. The Photo may not be doing it justice as it was taken with a crappy mobile phone camera. I should repost a better pic. I like this tattoo a lot. I like the subject, the design, the colors, but I agree with thetruthhurts ... it needs more contrast. As it is, it looks like an old tattoo that has faded. But maybe it is? The entire piece is decent overall. I would go back in for some contrast shading to make this piece as dynamic as the subject matter.